The group art exhibition will be bigger than ever, with shows, workshops, and conversations that go beyond art. 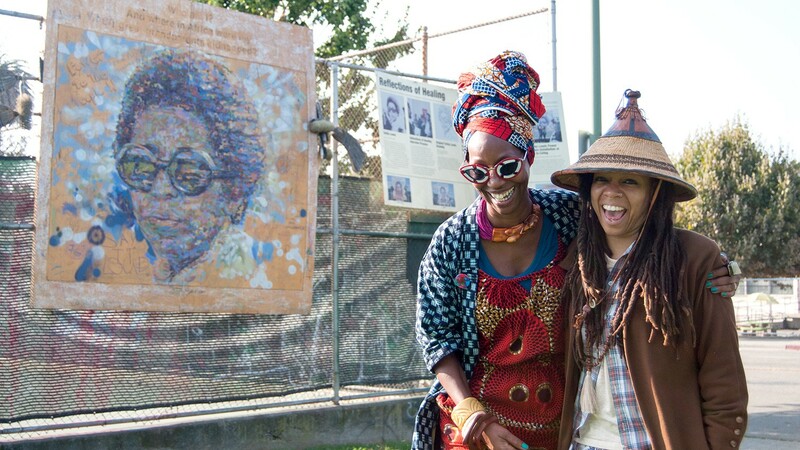 Karen Seneferu (left) and Melorra Green have grown their exhibit over the years. In 2012, Melorra Green was curating exhibitions at the African American Art & Culture Complex in San Francisco. At the time, there were few spaces in the Bay Area exhibiting Black artists, and fewer hosting solo exhibitions for them. In her curatorial role, Green reached out to artist Karen Seneferu with an opportunity. "I wanted to create solo exhibitions and I saw that there were not that many spaces where Black artists could have that," she said. "I wanted to identify the next mammoth artist, and when I saw Seneferu's work I thought, 'I really want to work with her.'" Green offered Seneferu a solo exhibition in the complex's Sargent Johnson Gallery. "Even though I had gotten into a number of museums and galleries, I was thinking of the women whose artwork had inspired me, women who had been creating for a much longer period of time," she said. "I didn't feel that it was ethical for me to take that spot." So, Green rephrased the question. Instead of asking if Seneferu would exhibit, she asked Seneferu what she wanted to do next. Together, they've been answering that question ever since. This year, their fifth annual group art exhibition of The Black Woman is God comes to the East Bay for the first time. From Aug. 25 to Oct. 26, Oakland's Betti Ono, Ashara Ekundayo Gallery, and Thelma Harris Art Gallery will host panels, events, and satellite exhibitions in tandem with the main exhibit at SOMArts. Before it was an exhibition or a "movement-building platform," The Black Woman is God was an idea in the minds of Seneferu and Green. In plotting a show, the two women became friends, sisters, and co-curators, imagining an exhibition of emerging and veteran Black women artists, a new space for these women to tell their stories together. They spent 2012 planning this show against the backdrop of national and local politics. In a conversation among themselves, they reflected on the resilience of Black women and wondered how it was that a group of people could endure so much. "That's because the Black woman is god, of course," said Seneferu. The sentiment cemented the purpose of their work and gave the nascent exhibition its name. That year, Seneferu and Green fit as many artists as they could into the Sargent Johnson Gallery, a space that is just a little under 800 square feet. But they wanted it to be bigger. They began to shop the exhibition to other galleries in San Francisco, applying and inquiring about being included in different spaces. The world of art galleries has long been a predominantly white space, and access to those spaces has largely been controlled by white gatekeepers. At the time, shows like the Richmond Art Center's The Art of Living Black, a group exhibition started in 1996, and The Black Woman is God existed as outliers and responses to the persistent whiteness in the spotlighting of contemporary local art. In interviews and applications, the gatekeepers in the San Francisco art world always posed the same questions: If we put this in our space, will people come? Will they get it? The interviewers always seemed to assume the answer was no. That is, until Fallon Young, then the interim executive director at SOMArts, approached Green and Seneferu about putting the show in her gallery. With over 3,000 square feet, the space was nearly four times bigger than the Sargent Johnson Gallery. They accepted the offer. In 2016, the exhibit moved to SOMArts, featuring over 60 Black women artists. With its opening just days after Alton Sterling and Philando Castile were killed by law enforcement officers, it was impossible to ignore the precariousness of Black life in America and the ever-present danger of occupying a Black body. In light of these events, the artists decided to forgo a typical reception, instead choosing to make a statement about Black lives. "That first year we walked in with pictures of people who had been murdered, some popular, some not," said Green. "We began to understand that Black bodies coming together in unison, saying something, showing something, can cause a conjuring of energy. Each year our charge will be to never forget what's happening beyond these gallery walls. We're always going to use that unification and our voices to elevate what's happening." The second year at SOMArts, the exhibit featured over 80 artists and incorporated an auxiliary event. About 1,200 people attended the opening reception with another 800 coming through during the month-long exhibition, making it the most well-attended exhibit at SOMArts in 2017. "The exhibition solidified the community in ways that we hadn't seen before," said Seneferu. "We started to get an inter-generational audience." This year's exhibition, The Black Woman is God: Assembly of Gods, seeks to increase its impact even more by expanding into Oakland and including more curators and spaces. In addition to the gallery shows, East Bay events will take place at Regina's Door, Little Bobby Hutton Park, Plant Based Fitness, Malonga Casquelourd Center for the Arts, the East Bay Meditation Center, and Head Designs, as well as three more venues in San Francisco. And it's not just about art this year. The conversations and workshops in Assembly of Gods will address topics of wellness, beauty, self-healing, and self-love as it pertains to Black women and the Black community. "Our initial intention [in creating the exhibition] was to connect to the spirit that we are," said Seneferu. "To do that as a Black person is political because we're supposed to be fitting in and affirming one cultural reality, but that's not what we're about. We're about claiming our beauty, claiming our spirit, our culture, our principles, our belief systems. And it's speaking to a wide range of people that need that. It's important not only to Black women but to the Black community and other communities that are looking to us as a model of how to move forward."